Definition at line 302 of file llfloateravatarlist.h. 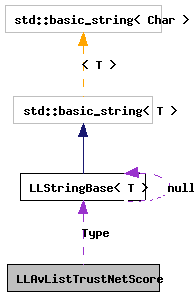 Definition at line 96 of file llfloateravatarlist.cpp. References Score, type, and Type. Definition at line 304 of file llfloateravatarlist.h. Referenced by LLFloaterAvatarList::getAvatarColor(), LLAvListTrustNetScore(), and LLFloaterAvatarList::refreshAvatarList(). Definition at line 305 of file llfloateravatarlist.h.